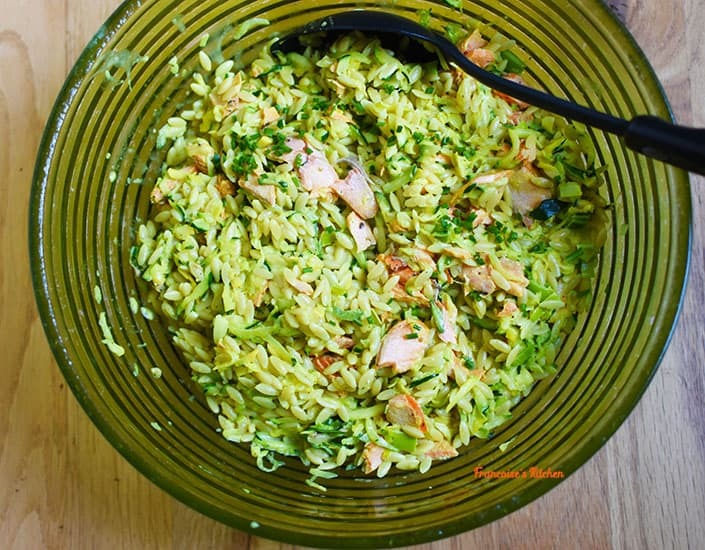 Creamy Orzo Pasta with Salmon, Zucchinis, and Leek is a quick recipe which I can prepare during a busy week and it is always a hit at home. It is a convenient dish that I like to save for my two teenage boys’ lunch boxes, so they can have a delicious meal for school! 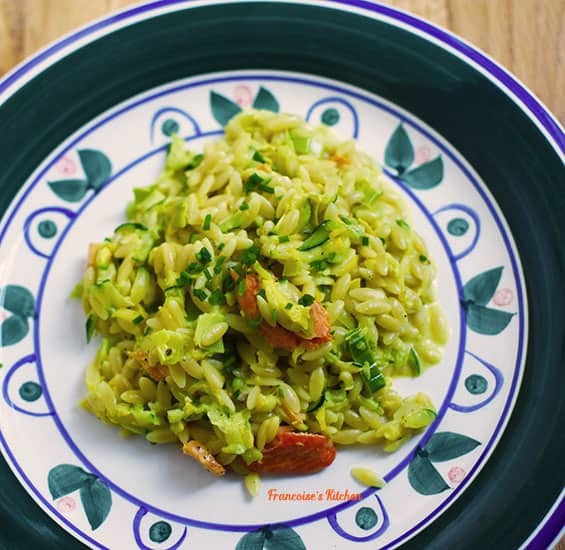 Shredded zucchinis give a nice creaminess to the dish and easily replaces a portion of orzo without anyone really noticing. Preheat oven at 350 F. On a baking sheet with parchment paper, put the salmon, season evenly with salt, pepper, herbs de Provence (or Italian seasoning), squeeze some lemon, and drizzle olive oil. Put in the oven for about 15 minutes or until cooked through. Set aside and let it cool. Remove skin, flake the salmon with your hands or with a fork. Bring a large saucepan of salted water to a boil. Add orzo and cook for about 8 minutes or until al dente, stirring from time to time. Before draining, keep ½ cup of liquid. Return orzo to the pot so it does not dry out in the colander. Meanwhile, take a large pan, put some olive oil, add garlic, the leek, the shredded zucchini and cook until lightly soft 8-10 minutes. Pour the heavy cream, ¼ cup of cooking liquid pasta, zest lemon, turmeric, salt, pepper, and lemon juice. Mix well and let it cook gently until it becomes creamier, adding more liquid if needed. Add the orzo, mix well, taste if you need more seasoning. Then add the salmon and mix gently to not crumble the salmon too much. Put it in a big bowl and garnish with some chives. You may lightly grate some Parmesan-Reggiano or Pecorino cheese on top. Bon Appetit!